Octobar Stretch Tent. Side on. Sides off. The Octobar stretch tent is a bit different from our stretch tents with 8 entry and exit points. 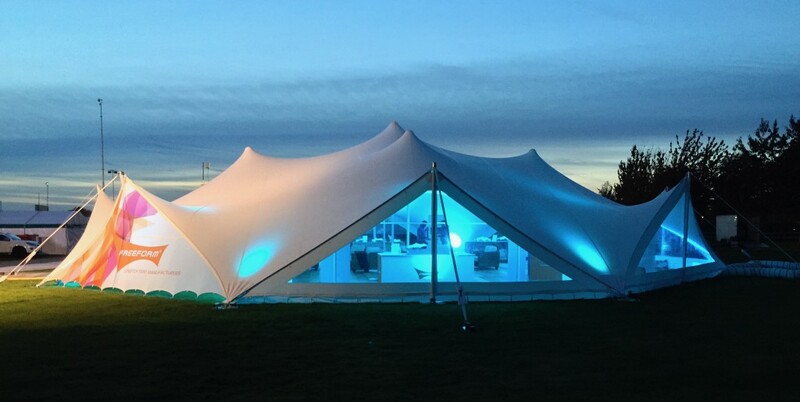 The Octobar stretch tent comes with custom-made walls or windows that fit perfectly into each entrance/exit. For that reason the tent can be rigged with doors on or off, depending on the clients needs. Sides on. Sides off. The choice is yours. As a result we can use this flexibility to create a unique and beautiful open-sided structure. This allows your guests to enjoy a more open air experience with the sides off or comfort from the elements with sides on. The Octobar Stretch tent has only 5 main interior poles due to its simple design. Hence it has a very efficient use of available space while still offering excellent weather options. We rent this stretch tent style out regularly to clients who want not only the good looks of a stretch tent but also a statement. The Octobar is the sturdiest of all the stretch tent structures due to its shape and design. With a rigging time of around 3 hours it makes it one of the most appealing tents on the market.